Born in Melbourne to Chinese parents, Roland discovered his passion for conducting and the associated leadership while studying a Bachelor of Music Education at the University of Melbourne. In those years he was fortunate to have the opportunity of learning conducting from Japanese conductor Yoshinao Osawa, and the late Robbie Rosen a Hungarian national. Upon graduation, his first appointment as music teacher was to Blackburn High School where he became Music Co-ordinator and lead the development of the music program for most of the fourteen years at the school. 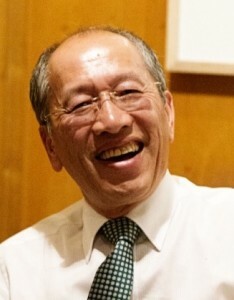 Later, he was appointed Director of Music at Carey Baptist Grammar School where he developed a comprehensive class music and music performance program, and designing new music facilities over nineteen years until his retirement in 2012. Roland’s interest in conducting has seen him travel extensively. He completed a Master of Arts degree major in conducting studies and music education at Columbia University (NY) and participated in a number of conducting workshops and classes lead by maestros including Don Hunsberger, Donald Portnoy and Paul Vermel. A highlight of his studies was a trip to China conducting members of the National Opera of China in Beijing and the Xian Conservatory Symphony Orchestra. It was in Xian that he conducted the Butterfly Lovers Violin Concerto for the first time. Roland is principal conductor and music director of The Grainger Wind Symphony and was on its founding committee in 1986. He was awarded life membership in 1996. With the committee, Roland plans the years’ concert programs and he conducts most performances. He is also sought after as an adjudicator at music competitions and eisteddfods including the Royal South Street Society Ballarat and the Singapore Youth Music Festival. He was the artistic director of the Allans Billy Hyde Melbourne School Bands Festival. Roland is a curriculum writer. He has written Victorian Certificate of Education music study designs, prescribed lists and support materials. He was the Chief Assessor for VCE Music Solo Performance for a number of years. He visits schools to give VCE Music Masterclasses. Roland, now a freelance music educator, conductor, adjudicator, mentor and tutor is available to guest conduct, lead workshops, adjudicate, tutor and teach music including instrumental, conducting and VCE music performance. Roland has life membership awards from the Australian Band and Orchestra Directors Association (National), the Association of Directors of Music in Independent Schools (Vic), The Grainger Wind Symphony and the Association of Music Educators (Vic). He has also been awarded an Excellence Award of the Australian Band and Orchestra Director’s Association (Victorian Branch) and an Outstanding Professional Service Award from the Council of Professional Teaching Associations of Victoria. Recently, Roland has commenced work as a Volunteer at the Grainger Museum, welcoming visitors, learning about handing materials and researching information.